PracticeLink.com S UMMER 2018 33 Look no further than beautiful Fairbanks, Alaska for a career to challenge your professional goals! Tanana Valley Clinic is a 60 provider clinic associated with Fairbanks Memorial Hospital. We offer competitive base and productivity pay, benefits, and a $65,000 sign on bonus. Our current opportunities are in Family Medicine (outpatient), Internal Medicine (outpatient ), Internal Medicine (inpatient Intensivist), General Surgery and Urology. Fairbanks is Alaska's second-largest city with a total service area population of more than 100,000. A university community with strong arts, music and culture, good schools and unlimited access to wilderness and adventure. Contact Suzan Bast, Physician Recruitment Program Manager 907.458.5302 suzan.bast@foundationhealth.org Provider Opportunities in Alaska Exposure by whistle-blowers Employees of health care providers also may be part of the mix. Whistle- blower laws give employees — often disgruntled ones — a percentage of the amou nts recovered for improper billing. For example, a nurse employed by a Houston su rgical center reported that a gastroenterologist performed many colonoscopies in less than two minutes, failed to follow proper sanitation procedures, and failed to perform procedures necessary to catch cancerous lesions. The case settled for $1.6 million, and the nurse will receive part of the settlement. Investigation techniques One of the government's tools for enforcement is data analysis, which may include looking for outliers (a process sometimes referred to as "anomaly-detection models"), such as providers who are ordering a substantially larger number of services than would be expected for similar providers. Investigators also study data from past fraud cases, then program their computers to look for similar patterns. In addition, CMS applies a "social network analysis" on the "birds of a feather…" theory. Providers should be careful of who their friends are. If reliable information of an overpay ment exists, CM S has authority to suspend Medicare payments to a provider. In FY2016, C M S m a de 5 0 8 su sp ensions on that basis. 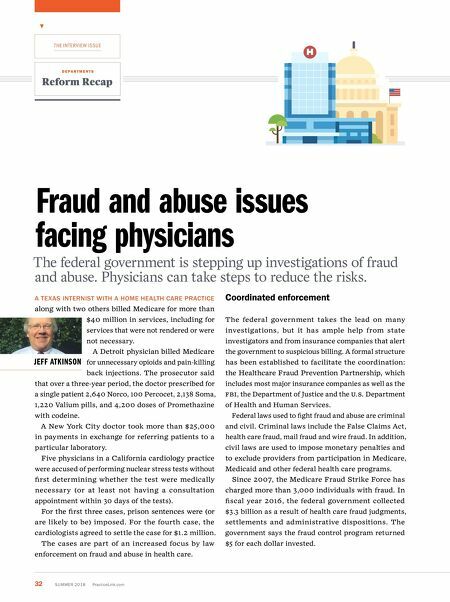 The inspector general says that the Fraud Prevention System (FPS) "is not as effective in preventing fraud, waste and abuse in Medicare as it could be." The report suggested the FPS identify aberrant providers more promptly because, by the time action is taken, more overpayments by the government have been made and the providers may have fewer assets from which to collect. 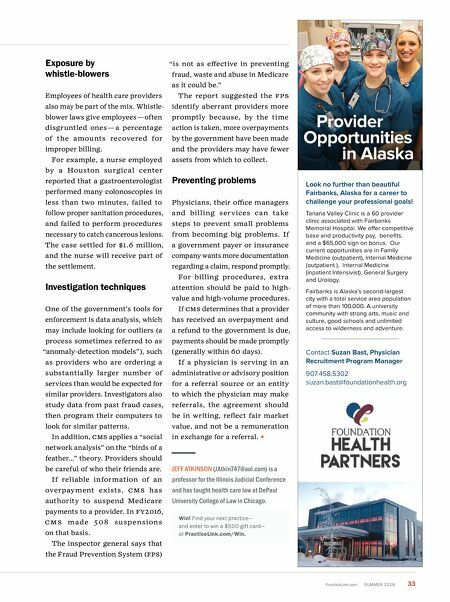 Preventing problems Physicians, their office managers and billing serv ices can take steps to prevent small problems from becoming big problems. If a government payer or insurance company wants more documentation regarding a claim, respond promptly. For billing procedures, extra attention should be paid to high- value and high-volume procedures. If CMS determines that a provider has received an overpayment and a refund to the government is due, payments should be made promptly (generally within 60 days). If a physician is serving in an administrative or advisory position for a referral source or an entity to which the physician may make referrals, the agreement should be in writing, reflect fair market value, and not be a remuneration in exchange for a referral. JEFF ATKINSON (JAtkin747@aol.com) is a professor for the Illinois Judicial Conference and has taught health care law at DePaul University College of Law in Chicago. Win! Find your next practice— and enter to win a $500 gift card— at PracticeLink.com/Win.